an overall environment of insanity, a kaleidoscope of bizarre behavior and shocking bloodshed. who are likely to cringe and laugh in equal measures. Taxi Driver and Audition, the film creates a nightmarish landscape of madness and murder. Rising horror director Mickey Keating has been exploring insanity for his last few films, and after the monochromatic psychodrama of DARLING and the desert dementia of CARNAGE PARK, he goes full-blown crazy with PSYCHOPATHS, abandoning conventional storytelling to plunge into the avant-garde. A world premiere at the current Tribeca Film Festival, PSYCHOPATHS was described by Keating during the post-screening Q&A as “a collage of violence and glamour,” and that’s a pretty accurate and succinct summation. To detail: the movie begins with the rants of serial killer Henry Earl Starkweather (Larry Fessenden), who promises that his impending execution will unleash an explosion of violent mania across the land. And sure enough, the ensemble we meet following his introduction is chock full o’ nuts. There’s Alice (PARK’s Ashley Bell), with a murderous split personality who dwells in a fantasy world modeled on 1950s musicals; the Midnight Strangler (James Landry Hébert), first seen claiming a victim in a seedy motel; and a killer (Shudder curator Samuel D. Zimmerman) who wears a series of plastic masks. Then there are those who victimize these victimizers, including Blondie (TRASH FIRE’s Angela Trimbur), a would-be Midnight Stranglee who turns the tables on her attacker and subjects him to even worse treatment than he had in mind for her, and an out-of-control cop (THE BATTERY filmmaker/star Jeremy Gardner) determined to nail the masked man. As we follow this gallery of maniacs, a couple of their exploits intersect, though Keating’s intent is less to create a shared-world narrative and more to present an overall environment of insanity, a kaleidoscope of bizarre behavior and shocking bloodshed. To do so, the writer/director applies a very loose approach to narrative that might confound viewers expecting a traditional portrait of some serial killers, and will fascinate others who’ll find themselves caught up in the accumulating, accelerating madness. Keating is after impact via imagery and sound, and both are as varied and off-kilter as the psyches on display, while he once again pays homage to past cinematic favorites. 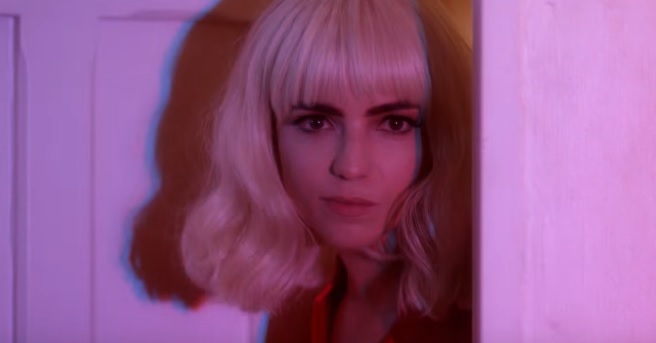 With cinematographer Mac Fisken, he adopts different lighting and color schemes from character to character, ranging from noirish shadow play to giallo-esque primary colors, and editor Valerie Krulfeifer assembles it all with echoes of David Lynch surrealism. That feeling is furthered by the soundtrack, including a mix of hypnotic original compositions by Shayfer James and others and some well-chosen vintage songs. More than just a technical exercise, PSYCHOPATHS is also a showcase for several different styles of unhinged acting, which is what truly holds the attention. All the leads convincingly convey their variously disturbed states of mind, but Bell commands the most attention as the singing and dancing, slicing and dicing Alice. From THE LAST EXORCISM through the underseen THE DAY and now her one-two punch with Keating, she has proven herself a genre actress with true range and a willingness to play any role to the hilt. It has always been interesting to see which fear stream Keating will head down next, and one hopes he will continue to take Bell with him. 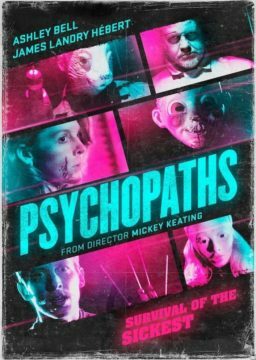 Mickey Keating’s ‘Psychopaths’ works because it knows exactly what it is – a ludicrous, ridiculously over-the-top and unabashedly gory and grisly horror film. The movie is the seventh feature from Keating, whose work indicates a strong passion and appreciation for the twisted. He has a lot of room to grow as a director but his recent efforts signal that he is going to be an exciting talent to continue to watch (his 2015 film “Darling” is worth seeking out for its bizarre narrative and gorgeous black and white cinematography). The movie hits the ground running, featuring a creepy message from Henry Earl Starckweather (Larry Fessenden), a known serial killer about to be executed. His departing words warn of a “night of chaos,” where brutal murders will occur throughout the evening – think “The Purge” but less political. The titular psychopaths include Blondie (Angela Trimbur) and Alice (Ashley Bell), who escaped from an overturn bus from a mental hospital. 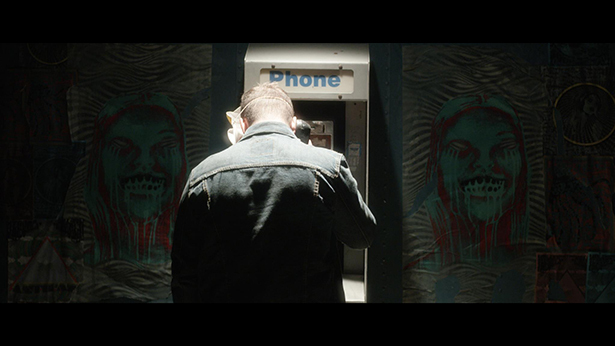 Thrown into the mix is Mask (newcomer Sam Zimmerman), who stalks the city in a variety of masks with his own deadly agenda. Most of “Psychopaths” feels slight, like a series of vignettes in search of a larger narrative, but that doesn’t mean it isn’t any fun. Keating finds creative ways to get under your skin and affect you by the onscreen carnage. The film feels like a loving wink to horror films of the 70s and 80s, featuring wipes and split screens, along with a narrator guiding us on this blood-soaked journey. 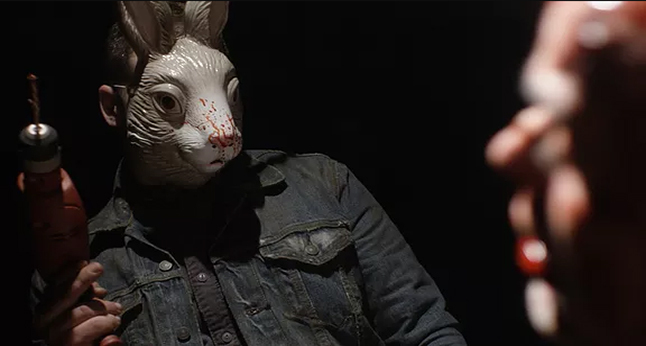 As the movie comes to a close, the narrator says, “Sorry if the violence was too gratuitous and the story was too ambiguous,” which is an interesting contradiction, of sorts, for “Psychopaths.” If anything, it reiterates the movie’s self-aware style but also, it’s interesting that anyone in this movie – narrator or otherwise – would mutter the word “sorry” in something that is so unapologetic. “Psychopaths” is a dog whistle for midnight movie fans, who are likely to cringe and laugh in equal measures. 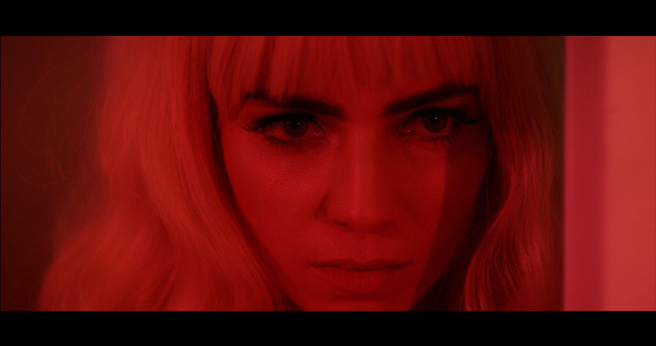 Director Mickey Keating has made a series of fascinating chillers–from Darling to Carnage Park–but nothing as ambitious and fabulously deranged as this dream-like shocker. On the eve of messianic mass murderer Henry Starkweather’s (Larry Fessenden) execution he prophesies a night of “chaos” where his “children” will wreak terror. Sure enough, we helplessly watch random scenes of loony killers causing carnage- from mask wearing assassins, to stranglers, to schizophrenic escaped female mental patients, all cutting a bloody path across the land. With a hallucinatory visual and aural sense, and interspersed with nice nods to movies like Taxi Driver and Audition, the film creates a nightmarish landscape of madness and murder. Psychopaths, the latest film from writer/director Mickey Keating, recently enjoyed its world premiere at the 2017 Tribeca Film Festival. Daily Dead had the chance to speak with Keating and Psychopaths co-stars Ashley Bell and Larry Fessenden, and the trio discussed reteaming for their latest collaboration (both Bell and Fessenden were in Keating’s previous genre effort, Carnage Park) and what fans can expect from Keating’s latest slice of horror-fueled fun. For those who may miss out on Psychopaths during Tribeca, the film heads to The Overlook Film Festival later this week. Great to speak with you today, guys, and I can’t wait to see the movie. So, Mickey, can you discuss what inspired you this time around? From what I’ve seen from the clips and different publicity materials, this feels like a complete 180 from Carnage Park and your other previous projects. Mickey Keating: Yeah, what was kind of fun for me was that Carnage Park is my love letter to the ’70s, and this is kind of like my celebration of the films of the ’80s and ’90s in terms of these heavy glamorous visuals and this crazy soundtrack—we even have 18 songs in the movie. And so I was looking to directors who, in that time period, really went wild with lighting and style and everything. Ashley and Larry, you guys have worked with Mickey before, so what was different for you this time around? What did you see in the script for Psychopaths that hooked you, where you just knew this was something you wanted to be a part of? Ashley Bell: I think for Psychopaths, I get to play a psychopath who’s stuck in a delusional reality where she thinks she’s in a 1950s Hollywood musical. So, I sing and dance and kill people, and when I read that and all the different aspects of Alice, it’s the kind of a role you dream will come along as an actor. In terms of working with Mickey, he has this core group of people he works with and after doing Carnage Park, I hoped I’d get to come back and be a part of this collaborative process that happens, that just allows you to go off the deep end and know you’re going to be caught by those you’re working with. So it was another wonderful experience. Larry Fessenden: Well, I came to the project early when it was in script form, and Mickey was looking for some production support. He had some investors, but he wasn’t sure how to put it together. So he came to Glass Eye [Pictures]. We’d already done the movie Darling together, and I’d been watching Mickey and participating in his other films just as an actor. So it was great to get back involved. Jenn Wexler, who produced this for me, she went out to LA and set up the production with Mickey’s core people. It’s a real pleasure to work with a director that knows what they want and has a very clear vision. That’s the case with Mickey. He’s fun to talk about movies with and you just know there’s a very efficient, engaged approach. Some directors aren’t true to themselves, and you have to provide another form of support, but with Mickey, you just let him go and play in his sandbox and make sure he has all the tools you can afford at this budget level. My agenda is to stay out of the way of the director, and just let them find their way through the project. And you know Mickey’s unspoken secret weapon is Val [Krulfeifer], his editor, and she’s awesome and tireless. It was really inspiring to see how much creativity came in during post-production on this one. As a follow-up to that, because I know that you’ve had such an amazing career over the years in terms of what you’ve been able to do for the independent scene of filmmaking, whether it’s behind the scenes or in front of the camera, when you’re looking at different projects that come your way, are there things you look for when you’re coming in as a producer? And I also want to just quickly say that another one you recently produced, Like Me, was so great and I absolutely loved your performance in that one as well. 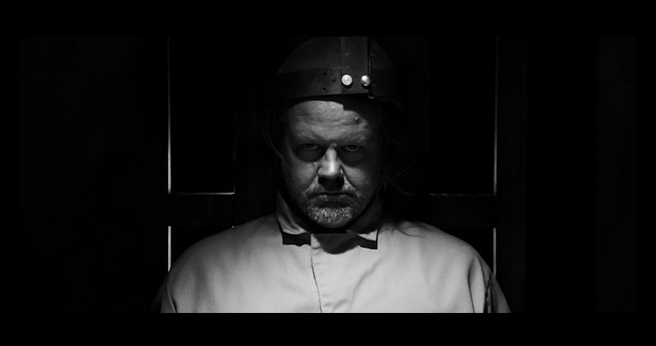 Larry Fessenden: Fantastic. I’m delighted to hear that. I look for an authentic, very genuine, personal voice. If it’s in the genre, that’s an extra treat, but that’s not always what motivates me. I like people who want to expose something about themselves or the language of cinema and give us something unique. Honestly, there’s a lot of media out there. You can watch a great TV show anytime, stream anything, or watch the classics. So you need something to make a new piece specific and personal to it, and I enjoy working with someone like Mickey who is always going to bring his own sensibility to the project. Mickey, it’s been really fun to watch your career through the years and your output as a filmmaker is crazy, which I mean as a compliment. I’m curious, for you, is there a challenge at this stage in your career to tell new stories, and how do you find ways to keep everything new and exciting to you as a storyteller? Mickey Keating: Well, I look at somebody like [Rainer Werner] Fassbinder, who made forty movies in ten years, or even Joe Swanberg who is working today. I’m very lucky to have come up in this generation of filmmaking where the technology is available to me. So, in my mind, 365 days of the year I’m squarely focused on making movies. I don’t really have any other hobbies or interests. I only ever want to make movies, and when I’m not, I’m panicking. Someone like Joe Swanberg is a great reference for that because he’s always exercising that creative muscle. One of my favorite directors of all time is Robert Altman, too, and he made seven movies in five years or something like that. So I think I’m just trying to keep up with the filmmakers I admire. Ashley, your career’s been incredibly fun to follow, and again, I think my favorite part of Carnage Park last year was that Mickey gave you a role that was so different than what we’ve seen from you before. Have you been enjoying the freedoms that come from working within the realm of independent filmmaking, where you get the chance to have fun with characters you may not necessarily see on the studio side of the business? Ashley Bell: Absolutely. After The Last Exorcism 2, I kind of shied away form the genre. I wanted to do comedy and do Broadway, but when I read Carnage Park, I sped through it at like two in the morning, and I was sitting there with this excitement over the script. I knew I had to fight to play Vivian and once I met Mickey, the fact that he liked characters, real three-dimensional characters, that’s always what I’ve wanted to do. And when Psychopaths came along, it was a real treat to be allowed to play a villain. When I looked at the character of Alice in Psychopaths, I fell in love with her. She’s not evil. She’s just different. She just needs a friend. So, in working and talking and rehearsing with Mickey, it was kind of like finding what was broken inside of her and how she got broken. It was a tremendous treat and again, when you have a filmmaker like Mickey who’s seen everything and knows so many things in cinema inside and out, so he knows the rules and then can just break them and innovate upon them, that’s what’s most exciting to me as a performer. In the course of his short but prolific career, writer-director Mickey Keating has been responsible for creating some memorably twisted characters, from Lauren Ashley Carter’s unraveling housesitter in the haunted house film Darling to Pat Healy’s homicidal sniper in the survival-thriller Carnage Park. But, if we’re understanding matters correctly, with his new film Psychopaths, Keating has set out to see what would happen if he filled a film with nothing but maniacs. The film concerns a sort of Mischief Night for a group of serial killers which is triggered by the execution by electric chair of a madman in an unidentified prison. There’s Alice (Ashley Bell), an escaped mental patient who thinks she’s living in a 1950s glamour world; Blondie (Angela Trimbur), a beautiful seductress who lures men down into her suburban basement; a strangler (James Landry Hébert) who preys on unsuspecting women; and an enigmatic masked contract killer (Sam Zimmerman) whose next job sends him to seedy nightclub. As the night progresses, the body count rises and the fate of these deranged murderers is sealed in blood. 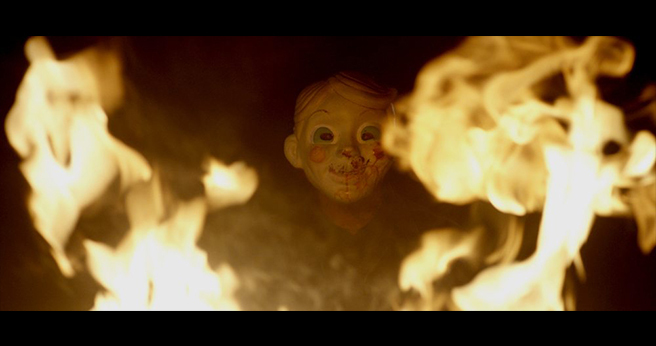 Psychopaths receives its world premiere at the forthcoming Tribeca Film Festival on April 20. Watch the exclusive first clip above. Psychopaths is a 2017 American horror film written and directed by Mickey Keating (Carnage Park; Darling; Pod; Ritual). The film stars Jeff Daniel Phillips (The Ice Cream Truck; 31; Halloween II), Ashley Bell (Carnage Park; The Day; The Last Exorcism and sequel), Angela Trimbur (Trash Fire; The Final Girls), James Landry Hébert (Ghost House; Carnage Park), Helen Rogers (Darling; Body; V/H/S), Matt Mercer (Beyond the Gates; The Mind’s Eye; Contracted and sequel), Mark Kassen, Jeremy Gardner (The Mind’s Eye; The Battery; Spring), Padraig Reynolds (director of The Devil’s Dolls; Rites of Spring). Principal shooting on the Bad Camal/Glass Eye Pix/High Window Films production wrapped on March 4 and the film is now in post-production. Keating was also a producer, along with Jenn Wexler, William Day Frank, Cam McLellan and Al Lewison. Larry Fessenden served as executive producer. ANGEL TRIMBUR, “Blondie” is an American actress, comedian and dancer. 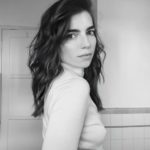 She is best known for her role as Isabel in “Trash Fire” starring opposite Adrian Grenier, Tina the wild 80’s party camp counselor in the horror comedy film The Final Girls (2015), and Penny Whitewall on FXX’s animated series Major Lazer. She has also had roles in the films Halloween II (2009) and The Kings of Summer (2013). ASHLEY BELL, “Alice” made her feature film debut in Lionsgate and Strike Entertainment’s thriller, The Last Exorcism (2010). Her performance garnered her an Independent Spirit Award nomination for Best Supporting Actress and an MTV Movie Award nomination, while the film grossed nearly $70 million, worldwide. The New York Post praised Bell’s performance as “Oscar-worthy” and one of the 10 best performances of 2010 for her extraordinary portrayal of the possessed “Nell Sweetzer”, which she will reprise in the highly-anticipated sequel, entitled The Last Exorcism Part II (2013), set to be released, nationwide, on March 1, 2013. JEFF DANIEL PHILLIPS, “Storyteller” A native of Chicago, Jeff Daniel Phillips’ artistic pursuits began with his studies of Fine Arts abroad and evolved into film making at the University of Southern California where he received degrees in both. After graduation, he developed a career both behind and in front of the camera. 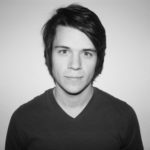 Jeff has over ten years experience working as a production designer, art director and prop master for film, television, music videos, commercials and print ads. 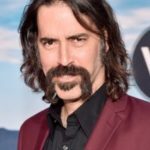 He has also acted on stage in the states and Europe, on television and in films such as Sneakers, Zodiac and Lords of Salem. 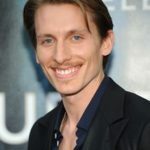 He most recently has a recurring role on the new series Westworld, produced by J.J. Abrams and directed by Jonathan Nolan for HBO and Rob Zombie’s upcoming film 31. JAMES LANDRY HEBERT, “The Strangler” was born on October 4, 1984 in New Orleans, Louisiana, USA. He is known for his work on Gangster Squad (2013), Looper (2012) and Seven Psychopaths (2012). MICKEY KEATING, writer/director – Mickey Keating is an LA-based writer/producer/director who made his debut at 22. His films include the occult thriller Ritual (2014), Pod (SXSW, 2015) and Darling (Fantastic Fest, 2015). Keating’s most recent film, Carnage Park premiered at Sundance 2016. He is represented by CAA and Circle of Confusion.